Sometimes simple mistakes while recording can lead to something good. That is exactly what happened to me and it turned into a simple technique I like to use to record really huge sounding backup vocals using just a few tracks. Normally, when you plug your mic into your audio device, this will be a “MONO” track. BUT, when moving quickly around the recording software, it is easy to forget to set your input channel to Channel 1 or Channel 2. So, your channel sits there in its default position of CHANNEL 1 & 2 – and your recording software thinks you are going to be sending it a STEREO signal. So, technically this is a mistake. NOTE: You will notice that, strangely, the reverb sounds like it is alone over on the right side – as if the vocal and the reverb are two separate things. Which, they kind of are separate from each other right now. 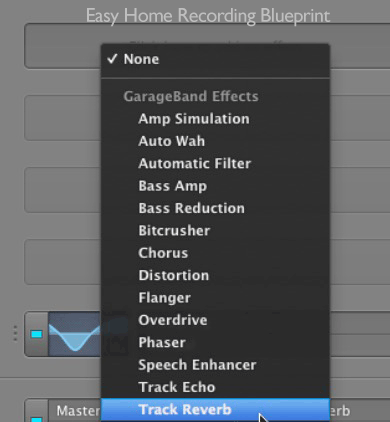 Turn your vocal track’s PANNING dial to the far right and begin nudging back toward the left. 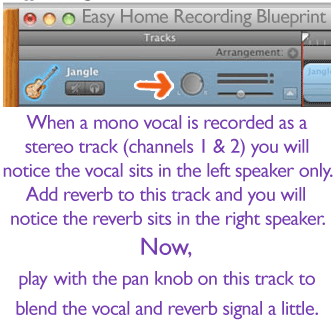 This will allow you to blend the VOCAL and its REVERB together – either a little or a lot. Turn your vocal track’s PAN dial all the way to the right and then begin backing it towards the left again until its REVERB is blended to your liking. NOTE: You will notice that even as you “blend” the reverb with the vocal, the vocal that has been recorded this way will always be weighted to the left. But, your reverb blend on the right balances this somewhat and the result is a rather huge spread. The vocal ends up sounding far bigger than expected. Just 2 or 3 tracks recorded in this way creates a huge effect real quick. 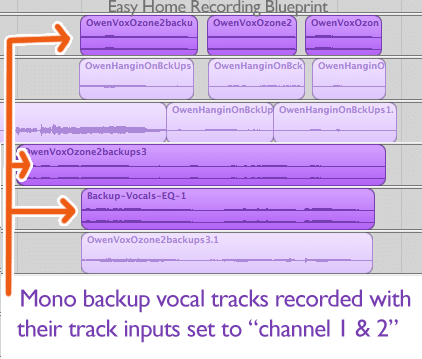 Now, add a couple of “correctly” recorded MONO (i.e. Channel 1 or Channel 2) vocal tracks and mix them with these mutant vocals we’ve been discussing. All of a sudden you’ve got what sounds like a choir even though it’s really just 4 or 5 tracks. Here is a vocal texture I recorded with just a couple of vocal tracks recorded using this “mistake” technique, and 2 vocal tracks recorded “properly”.